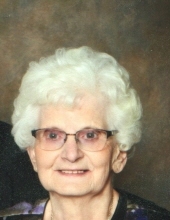 Grace Harriet Owenson died peacefully at home on September 11, 2018. Grace was born on October 19, 1928 to Lars and Johanna (Hatteburg) Akre in rural Palo Alto County, Iowa. She grew up on a farm near Newark, Illinois, and graduated from the Newark High School in 1946 and from the Chicago Lutheran Deaconess School of Nursing in 1949. On August 26, 1950 she married Curtis Owenson and moved to Iowa. Grace’s nursing career spanned 53 years primarily at the Story City Memorial Hospital and Semler Medical Clinic. She retired from McFarland Clinic in 2002. Grace was an active member of the Elim Lutheran Church, Randall, serving as a leader in the women’s circles and for the larger regional Women of the ELCA group. She was a charter member of the Story City Sons of Norway and performed with their Norwegian Folk Dancing group and served as an officer with the lodge. During retirement she spent countless hours quilting, crocheting, volunteering, and reading. She loved baking and contributed many pies, cookies and bars to events and organizations. Grace will be deeply missed by her husband of 68 years, Curtis Owenson and her three daughters - Peggy (Dan) Uthe, Kristi (Rick) Molln and Annette Owenson. Also surviving her are five grandchildren, Sara Uthe (Eric Holm), Russ (Erika) Uthe, Kelly (Matt) Smith, Kyla (Anthony) Heddlesten, Steven (Jennifer) Havens, and 2 step grandsons, Britt and Brook (Debra) Havens. Nine great-grandchildren and 42 nieces and nephews also survive her. Grace was preceded in death by her parents, nine siblings - Orvin Akre, Thor Akre, Gladys Jurney, Ralph Akre, John Akre, Louis Akre, Carrie Teig, Lawrence Akre, and Myrtle Johnson – and ten nieces and nephews. Visitation will be on Friday, September 14th from 5:00 to 7:00 p.m. and services will be held on Saturday, September 15th at 10:30 a.m. at Elim Lutheran Church in Randall, Iowa . In lieu of flowers the family would like donations to be made to Elim Lutheran Church, Randall, Iowa or the William R. Bliss Cancer Center, Ames, Iowa. To send flowers or a remembrance gift to the family of Grace H Owenson, please visit our Tribute Store. "Email Address" would like to share the life celebration of Grace H Owenson. Click on the "link" to go to share a favorite memory or leave a condolence message for the family.